Paradigmatic gaps ('missing' inflected forms) have traditionally been considered to be the random detritus of a language's history and marginal exceptions to the normal functioning of its inflectional system. Arguing that this is a misperception, Inflectional Defectiveness demonstrates that paradigmatic gaps are in fact normal and expected products of inflectional structure. 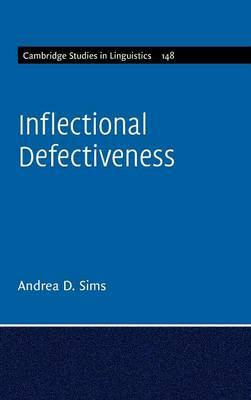 Sims offers an accessible exploration of how and why inflectional defectiveness arises, why it persists, and how it is learned. The book presents a theory of morphology which is rooted in the implicative structure of the paradigm. This systematic exploration of the topic also addresses questions of inflection class organization, the morphology-syntax interface, the structure of the lexicon, and the nature of productivity. Presenting a novel synthesis of established research and new empirical data, this work is significant for researchers and graduate students in all fields of linguistics.